This is a truly spectacular painting that I have always been fond of. There is a golden, late-afternoon light through the trees which is unmistakably Bierstadt; it is a painting that I’ve always wished I’d purchased for myself. Robert C. Vose Sr. acquired the painting on July 7th, 1959 through one of the greatest trades he ever engineered (and that is saying something). Twenty-nine years earlier, he had held a great exhibition of the work of the English painter Frank Brangwyn, and in his enthusiasm, had bought many of the paintings for himself and for the gallery. Interest in Brangwyn all but died in later years and furthermore the depression lingered on (at least as far as the picture business was concerned). To give you an idea of the depth to which Brangwyn prices had sunk, RCV sent two fine oils to auction in New York in the 1960s and they brought only $50 each. Anyway, as luck for RCV would have it, the Director of the San Joaquin Pioneer Museum in Stockton, California was still a great Brangwyn enthusiast. 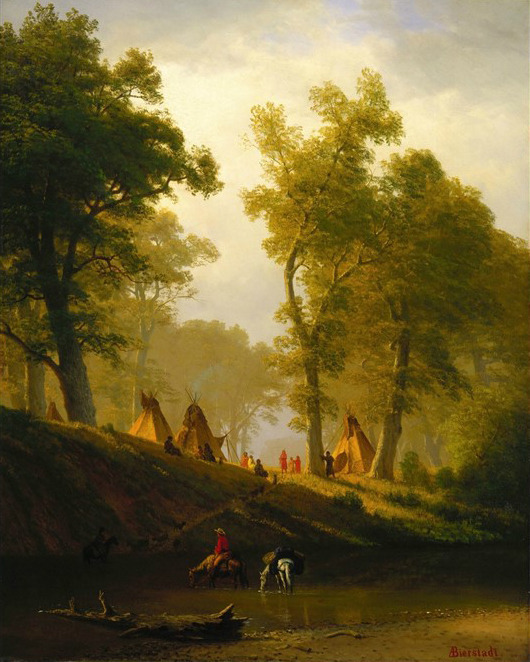 RCV traded the museum a group of top quality but utterly un-saleable Brangwyns for five big, spectacular Bierstadts of which this painting the Wolf River, Kansas was one. A second great painting from that lot, Spear Fishing at Night, went back to California as well; the current location, however is unknown. Seth Morton Vose sold this picture sight-unseen to a private collector in Detroit. The gentleman haggled Mort down over 20% and then either gave it or sold it to the Detroit Institute of Arts, discarding its magnificent original frame and putting on a narrow plain gold frame with, of all things, a linen liner! It remains in the collection of the Detroit Institute of Arts to this day. I’ve always wished I could have kept this one.